INTERVIEW: A Conversation with Julia Bryan-Wilson, Ph.D.
Dr. Julia Bryan-Wilson '95, Associate Professor of Modern and Contemporary Art at the University of California at Berkeley, recently gave a talk titled “Cecelia Vicuña and the Problem of Thread.” The annual Lee Frank Lecture in Art History, Bryan-Wilson’s talk discussed the intersections of political struggle and fiber arts in Chile during Pinochet’s regime in the 1970s, as well as the promise and reality of textiles and fiber arts in the world today. In an interview conducted by email, Bryan-Wilson answered questions about her experience at Swarthmore, discussed her path into academia and her current research, and offered advice for current Swatties. 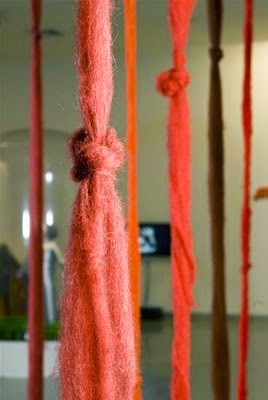 Cecila Vicuña, El Quipu Menstrual. I On the Arts: Can you talk about your experience as a Swarthmore student? Julia Bryan-Wilson: My time at Swarthmore was extreme--I found it exhilarating but also at times cruel. This polarization felt very particular to the place, to the atmosphere of intensity that, for better and for worse, Swarthmore tends to cultivate. I experienced feelings of class alienation and isolation, but of course I also made terrific friends and immersed myself in an exceptional education. IOtA: What classes/professors/mentors were most influential to you during your time here? JBW: The professor I took the most classes with was Nat Anderson, because I came to Swarthmore intending to be a poet, and because I was interested in what poetry might offer politically. Her workshops and seminars (one of which met at her house at the astonishing time of 6pm to 9pm on Friday evenings!) provided a model for me of focus and generosity. I also took several classes with Phil Weinstein-- I vividly recall both his Proust/Joyce/Faulkner course and a seminar on postcolonial literature as foundational for many of my current theoretical inclinations. Anthropologist Aisha Khan taught me so much about issues of diaspora and structures of racism. Alex Juhasz and Patty White were also extremely important to me in terms of feminism and queer methodologies; their influence has really shaped my scholarship. And of course my first art history classes were at Swarthmore -- T. Kaori Kitao and Connie Hungerford have had a lasting impact on how I view objects and art works. IOtA: How did you make the switch from English major to art history? What made you decide to pursue art history at the postgraduate level? JBW: My first scholarly love was literature. I applied to Swarthmore knowing it had a very strong English department and never considered any other undergraduate academic path. Partly, English literature seemed like the discipline where what we called in shorthand “critical theory” was most thriving in the mid 1990s. But more and more I felt myself pulled in the direction of the visual, and when I moved to Portland, Oregon after graduation I became involved in a very improvised, DIY art/performance/video world. I wanted to think histories of visual production from a feminist and a Marxist perspective, and so I went to UC Berkeley to work with art historians Anne Wagner and TJ Clark. I am constantly grateful that I did change directions, because fiction remains a source of pleasure for me, while going to museums can now sometimes feel like an obligation. IOtA: How did you know you wanted to become a professor? JBW: I have always wanted to be a teacher, and I have always wanted to be a writer, and being a professor is one way to do both. IOtA: How did you choose your field of study within art history? JBW: In part, I came to contemporary art because my friends were delving into performance and making their own zines and videos, and I wanted to pursue more historical dimensions of alternative or political production. But my research interests continue to shift and I look forward to seeing where—and when— they take me. IOtA: What research are you working on currently? JBW: I usually have several projects simmering at the same time. Yesterday I interviewed Hal Fischer, who in 1977 produced a book called Gay Semiotics, a conceptual photography piece that examined the hanky code used by cruising gay men in the Castro. This morning I’m finishing an essay on Liza Lou, who uses beads in her art and has worked alongside beaders in South Africa for the last 10 years. I’m also continuing to work on a book on textile handicraft since 1970. IOtA: What advice do you have for those students who wish to pursue academic careers? JBW: Take time off between college and applying to graduate school. There is no rush, and even if you end up as a temp in an office or working food service jobs (I did both of those myself), you end up getting a more solid idea about what you really want to pursue and who is out there to be in conversation with.